Meet the new breed of Christians shaping our culture. Alisa Harris grew up in a family that actively fought injustice and moral decay in America. She spent much of her childhood picketing abortion clinics and being home-schooled in the ways of conservative-Republican Christianity. As a teen she firmly believed that putting the right people in power would save the nation. But as she moved into adulthood, Alisa confronted unexpected complexities on issues that used to seem clear-cut. So, she set about evaluating the strident partisanship she had grown up with, considering other perspectives while staying true to the deep respect she held for her parents and for the Christian principles that had always motivated her. 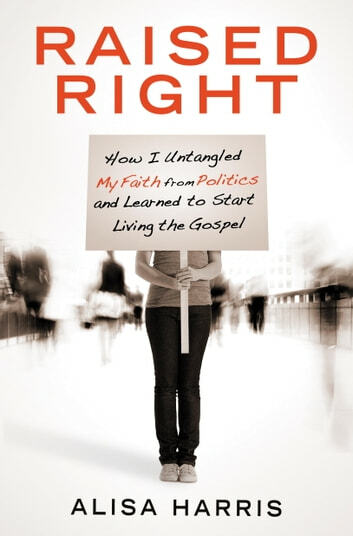 Raised Right is not only an intriguing chronicle of Alisa’s personal journey; it also provides a fascinating glimpse into the worldview of a younger generation of faith––followers of Christ who believe that the term “Christian” is not synonymous with a single political party or cultural issue. 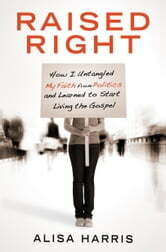 Whether you are moderate, conservative, or progressive, Raised Right will prompt you to consider more deeply what it means to affirm Christ-like justice, mercy, and righteousness in the current cultural landscape. And it will give you a deeper understanding of how the new generation of Christians approaches the intersection of faith and politics.